The vascular plant collection at UCSB was founded by Dr. Cornelius H. Muller in 1945 to provide support for the plant taxonomy and ecology courses that he taught. 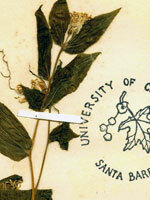 By 1948, a small working collection had been accumulated and housed in a herbarium case in Dr. Muller's office. In 1956, Dr. Muller was officially appointed Curator of the herbarium and he served in that position until 1966. The vascular plant herbarium houses approximately 90,000 sheets with a strong emphasis on local and ecologically sensitive plant communities. The collection includes materials from highly sensitive coastal wetland habitats in central and southern California, including both coasts of Baja California. The former herbarium director, Wayne Ferren, was an expert in salt marsh plants and collected extensively. Also, because of his expertise and interest in the conservation and restoration of vernal pools, we have a strong collection of vernal pool material. The large scale destruction and degradation of vernal pools in California make them one of the most threatened habitats in the state. As a result, our collections are a valuable resource for understanding the historic distribution and diversity of extinct vernal pools, for restoring surviving vernal pools, and for constructing new vernal pool communities. In parallel with our vertebrate collection, our herbarium contains material from the California transverse mountain ranges and the Carrizo Plain, both climatically and biogeographically unique regions with high endemism. Our ongoing efforts to database our vascular plant specimens has been aided by several grants from the National Science Foundation and the Institute of Museum and Library Services, as well as private donations. CCBER is also part of the Consortium of California Herbaria.